Got to wonder if Izzy has had a big under the table offer & wants out. Surely he can't be that stupid otherwise. If Qantas bails they'd have to sack him. Then again Rat's Arse isn't known as Forth Fumble for no reSON. I think that there is/are some very high up legal eagles that shares Izzy's beliefs and are willing to offer their services if his right to free speech is not upheld, regardless of the terms of his deal with RA. A precedent will then be set. I doubt free speech applies to employees of a company or organisation. I look forward to Qantas taking the moral high ground despite their continuing alliance with Qatar Airways and Emirates. Although I'm sure some legal eagles will argue, sacking Folau wouldn't impinge on his right to free speech. But your contract can stipulate that you do not do anything contrary to the company's code of conduct (see Spartan's post of the RA CoC). In fact, by sacking him, RA are saying that he's no longer under contract, so can't be held to their CoC; so it could free up Folau to post anything he cares about. 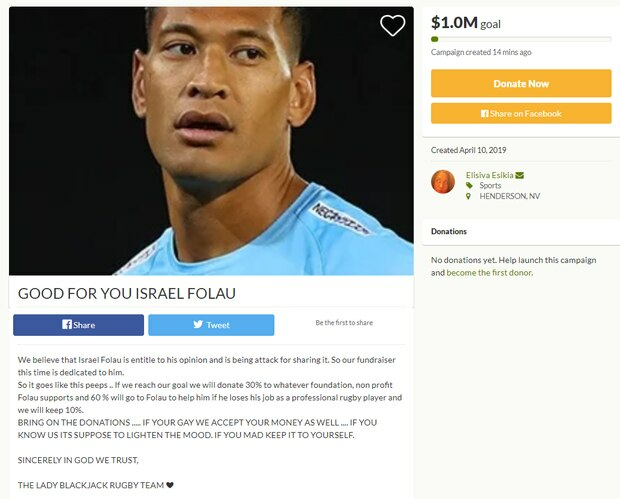 Sacking Folau would give him more freedom of speech! Contract terminated. I think he wanted out as it’s says in statement he couldn’t be contacted!! Rugby Australia are set to sack Israel Folau following his social media posts on Wednesday night, leaving the Wallabies’ preparations ahead of the World Cup in chaos. The governing body failed to make contact with Folau over the past 24 hours leaving Rugby Australia with no choice but to sack their super star fullback. Good riddence to bad rubbish! I look forward to Qantas taking the moral high ground despite their continuing alliance with Qatar Airways and Royal Jordanian Airways. Now they can give someone a chance on merit not on what the FURA have wasted on them!